The letters in parentheses ( ), below, refer to locations on this map. Cannon, near Fairview, faces Hazel Grove. Note the Rifle Pit (C2) on the middle right side of this 1999 photograph. Union Rifle Pit facing Hazel Grove (1999). Union Cannon near Fairview facing Hazel Grove (2002). Rifle pits (C1) are to the right and behind the cannon. Union Rifle Pits and Limber (2002). 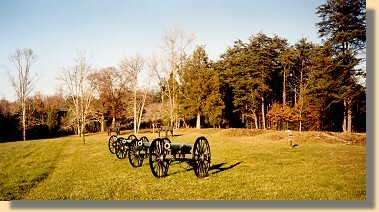 The Limber is for the Union cannon shown above. 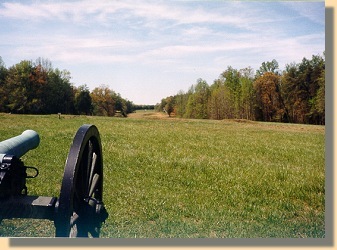 View from Rifle Pits (C1) towards the Chancellorsville Inn (B) (2002). 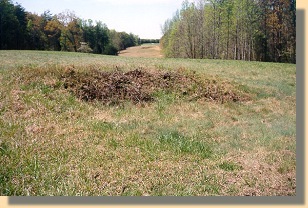 The Chancellorsville Inn ruins are near the tree line below (B). 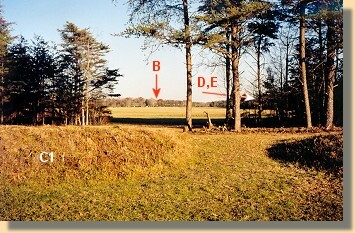 The site of the Fairview House (D) and the Chancellor Cemetery (E) are to the right beyond the near trees as indicated by (D,E).